Sherry, a fortified wine produced exclusively in the region of Andalucia in southwestern Spain, is the essence of this country. Ancient Phoenician traders built a business on it. British ship merchants risked stormy seas for it. Flamenco guitarists crooned about it. Food and wine aficionados have appreciated its versatility for pairing with many foods, preparing in cocktails, and adding a kick to soups, sauces and sautés. Sipping a cold glass of a dry fino sherry on a hot summer day with a plate of charcuterie, cheese, and fresh seafood may be one of the ultimate Spanish experiences. One big reason Sherry has been misunderstood is that many consumers were simply unaware of what Sherry is and how to enjoy it as an aperitif or with a meal. Sherry is not just one wine. It’s a spectrum of styles, all with unique palate personalities.The two driest styles are called fino and manzanilla. An amontillado is a toasty, spicier medium dry style, and oloroso is denser and semi-sweet. The two sweetest are raisiny Pedro Ximénez and cream Sherry. Sherry should be consumed chilled and fresh. Open bottles should not be left on a bar shelf or in a refrigerator for more than a few days as the wine will lose its freshness. To understand and appreciate Sherry’s complexity starts with the intricacies of how it is made and carefully blended. 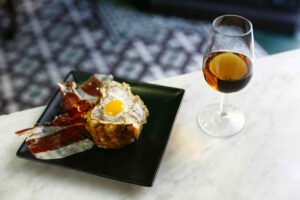 Located in the southwest coastal corner of Andalucia, The Sherry Triangle, officially called D.O. Jerez-Xérès-Sherry is where all sherry is made. The weather is hot and dry, tempered by ocean breezes. 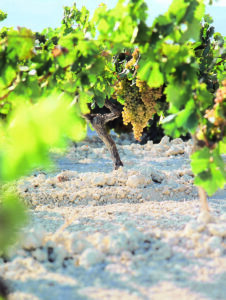 The startling chalky white soil, called albariza, is where Palomino Fino, a high acid white grape used to make almost all sherry, is cultivated. The other local grapes used for sweeter styles of Sherry are Moscatel and Pedro Ximénez. Production involves several key steps once grapes are crushed and the juice is fermented. The wine is fortified following fermentation with neutral grape spirits, such as the Airén, a widely planted Spanish white varietal. This process raises its alcohol by volume (ABV) levels to anywhere between 15 and 22 percent (still wine is usually 13-15 percent ABV). 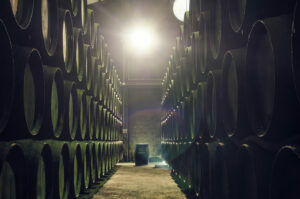 Sherry is then slowly oxidized; the exposure to oxygen is based on the style being produced. With a fino or manzanilla, a naturally occurring yeast strain called flor (the Spanish word for “flower”) develops and helps metabolize the fermentation process and preserve the dryness of these wines. Finally, sherry undergoes a fractional blending process referred to as the solera system. Visualize multiple rows of stacked oak barrels filled with the fortified juice; the youngest liquid on top and the oldest at the bottom. Younger wine slowly blends with older as it progresses down through the rows of barrels to create sherry’s mosaic of aromas and flavors. Scott Woltz, Wine Director for La Sirena, a Michelin rated restaurant in Manhattan known for its popular tapas bar, knows first-hand why educating customers about Sherry is key. “Sherry has for many years been the most difficult, misunderstood styles of wine to sell. Paul Grieco (of Terroir fame) famously gave it away just to have people willing to partake in the virtues of sherry. Manzanilla has delicate aroma and tastes of blanched raw almonds, apple essence, and chamomile flowers; which are grown in the area called Sanlucar de Barrameda where this elegant sherry is produced. 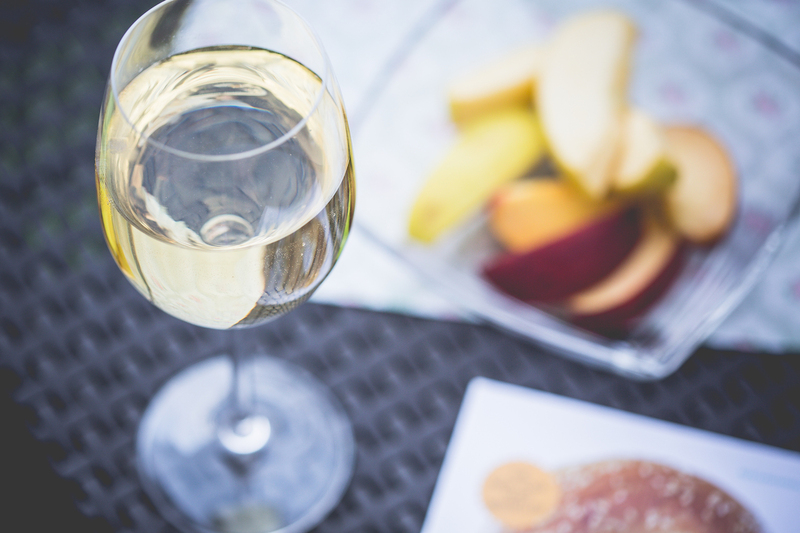 The name “manzanilla” translates to “earth apple” in Spanish. Fino is the driest and has tad nuttier flavor (think dry roasted almonds and a whiff of brine). This is the most widely produced dry Sherry. Both Manzanilla and Fino pair beautifully with many types of seafood, from sushi and grilled shrimp to smoked salmon and Japanese cuisine. A classic pairing is with cured meats like Spanish jamón, toasted nuts and olives. Consume bottles cold and within two days for optimum freshness. Amontillado is a dry sherry with a toastier hue and fuller aroma due to extended oxidation. The essences of toast and hazelnuts come to mind sipping an amontillado. This sherry pairs beautifully with sautéed mushrooms, creamy soups and chowders, and salted cod with roasted potatoes. Drink chilled. Oloroso (which means “fragrant” in Spanish) is a fuller flavored dark mahogany brown sherry. It ranges from slightly drier when made with 100 percent Palomino to sweeter when blended with Moscatel. Due to its longer aging, Oloroso has higher alcohol levels averaging around 18 percent. 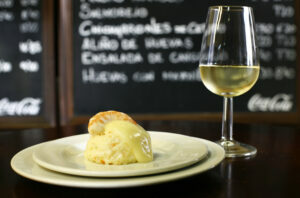 The fortification prevents the growth of flor yeasts found in drier fino and manzanilla sherries. This allows for longer aging and fuller flavor notes such as toasted walnuts, dried fruits, soft balsamic and allspice. This aromatic sherry pairs equally well with savory stews, roast duck or meat, wild mushroom casserole, foie gras and cured cheeses. As with the majority of Sherries, serve chilled. 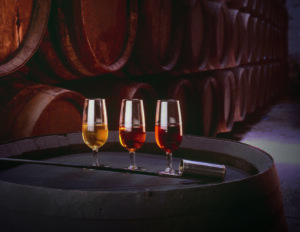 Palo Cortado is a rarer elegant aromatic sherry, prized by connoisseurs. Deep amber in color, Palo Cortado’s “wine personality” rests between an amontillado and an oloroso with soft round flavor notes of roasted walnuts and orange peel. Enjoy with cured meats and aged cheeses. Served very slightly chilled. Pedro Ximénez (PX) envelopes the mouth with the sweet taste of liquid black raisins. The Pedro Ximénez grape is actually a white varietal. The grapes are dried on straw mats in the hot sun to achieve their intense sweetness. Pair with crumbly blue cheeses or decadently drizzle over ice cream. Cream Sherry is sweetened Oloroso. Styles can range from chocolate and licorice to sweet roasted figs. While enjoyable served on the rocks or mixed with cocktails, cream sherry is also delicious served with warm pound cake and adds a spirited touch to French toast.